This topic contains 4 replies, has 2 voices, and was last updated by Antonino 3 years, 6 months ago. Hi I use the plugin for the registration of the user, the question is: how I can see the datas that I collect with custom fields in the form? There is some hack to display them in the users backend page? Please navigate to Wp User Frontend Pro->Settings->Login/registration then you have to set the registration page for the specific user role. If you have created the registration form for the subscriber then set the registration form for the subscriber role. After saving changes, user profile will get those custom fields. I have described the solution in my previous reply. 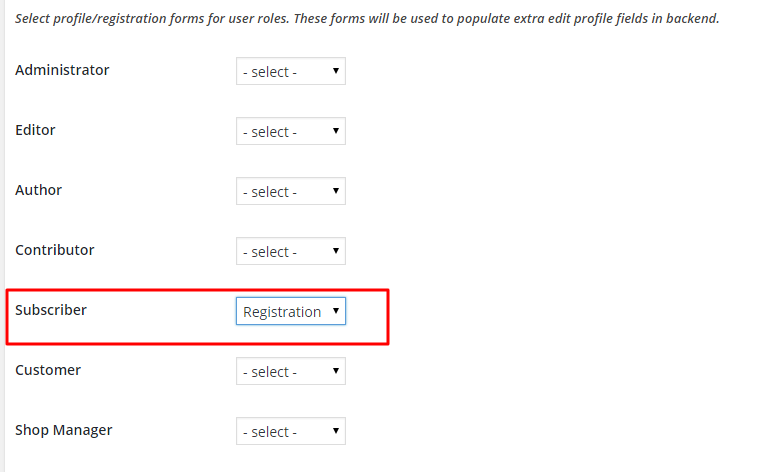 If you want to show those custom fields data into the user profile then you have to set the registration form to the specific user role. Now you have to decide for which user role this registration form will work. Then you have to assign the form from Wp User Frontend->Settings->Login/registration. Thank you so much, I did not understand and I was afraid that I have not explained well. The topic ‘Display custom field in user backend’ is closed to new replies.